What a delight birds in winter are in the garden! They entertain us with their antics, flashes of color and beautiful song--and they repay us by eating tons of insects. But birds need extra help in winter when natural food is scarce, and you can provide food and shelter by carefully incorporating some of their favorite plants into your landscape. Not only will you be helping the birds, but you will be increasing the beauty of your surroundings as well. "Those little nimble musicians of the air, that warble forth their curious ditties, with which nature hath furnished them to the shams of art." Berries and nuts: Include some shrubs and trees in your landscape that ripen in late fall and persist into winter as a good source of food for birds in winter. Good shrubs and trees for winter fruit are bayberry, beech, birch, black tupelo or sour gum (Nyssa sylvatica), boxelder (Acer negundo),cotoneaster, crabapple, dogwood, fir, hackberry, hawthorn, evergreen hollies, mountain ash, mulberry, nandina, juniper, various oaks for acorns, pine, pyracantha (firethorn), rugosa rose, Russian olive (Elaeagnus angustifolia), spicebush, spruce, strawberry tree (Arbutus unedo), sweetbay magnolia, viburnum, wax myrtle, winterberry holly (deciduous), yew. Seeds: You can help the birds in winter by leaving dried seedheads in the garden. Seedheads provide a good source of food for birds. Birds in winter will eat weed seeds where they can find them and will be attracted to your garden if you leave seedheads on your perennials and annuals. The garden may not be so tidy, but many seedheads are attractive and interesting in the garden in winter and are beautiful covered with frost or snow. If you have a vegetable garden, wait until spring to do your clean up, the birds will glean what seeds and insects they can over the winter. Perennials: Good perennials to grow for seeds include agastache, aster, baptisia, black-eyed Susan, butterfly weed, columbine, coneflower, coreopsis, foxglove, gaillardia, gazania, globe thistle, goldenrod, grasses, heuchera, hollyhock, Joe Pye weed, lavender, liatris, lobelia, lupine, monarda, nicotiana, pelargonium, penstemon, phlox, primrose, red-hot poker, rudbeckia, salvia, sedum, stokesia, and yarrow. Annuals: Among the choices of annuals are Love-lies-bleeding (amaranth), bachelor's button, cleome, cosmos, four o'clock, fuchsia, marigold, nasturtium, poppy, salvia, snapdragon, sunflower, zinnia. Vines: Vines include bittersweet, clematis, grape, honeysuckle, scarlet runner bean, sweet pea, trumpet vine, Virginia creeper. If you are fortunate enough to have mature existing trees on your property, you probably already have some species that birds favor for shelter, nesting and roosting. Having safe havens where birds can retreat to escape enemies and shelter from storms is very important. Identify your trees and add additional ones to make your property even more hospitable to birds in winter. If you have hardwoods, for instance, consider adding some dense evergreens that will not only give you color in winter, but will provide excellent cover for birds and provide food as well. If you have a bare lot, however, you will have to start from scratch, but that gives you the opportunity to create your own backyard sanctuary with careful selection and placement of trees and shrubs. Evergreens are very important to birds in winter because they provide dense shelter for protection from storms and roosting as well as food from seed-filled cones. Not only that, but evergreens are the foundation of your garden design, providing structure, screening, winter color and even home-grown holiday decorations. So plan to include evergreens on the periphery of your property, as hedging, as structure for your flower beds and as foundation plantings and choose those that are appropriate in scale for the location. Some evergreens are better than others as far as the birds are concerned. Arborvitae, camellias, cedars, chamaecyparis, firs, hemlocks, hollies, junipers, manzanita, mesquite, osmanthus, pines, rhododendrons, spruces, and yews give good shelter and cover. Supplemental feeding of birds in winter is very important for their survival. Usually, birds can find seeds and berries in winter, and some species like to scratch the ground and turn over leaves looking for insects, but if the ground is frozen hard or covered with snow, it is difficult for birds to find food, and that is when it is especially important to provide seed and suet in feeders. It is good to have several feeders on your property of different types to give less aggressive birds a chance to get to the food. If you observe your feeders for awhile, you will soon see that there are some species that are more aggressive than others. I like the habit of tufted titmice and chickadees that like to choose a seed from the feeder and fly off to find a perch to eat it--unlike types like cowbirds that will sit there and gorge. You will attract a larger number of species if you provide multiple feeders and offer several different types of food. Perhaps one feeder will be filled with black oil sunflower seed and you will attract house finches, goldfinches, purple finches, cardinals, grosbeaks, nuthatches, chickadees and titmice to it. Or another one could be filled with thistle (nyjer) seed and you will soon think you have drawn every goldfinch in the neighborhood! Suspend a wire basket with suet cakes and you will delight woodpeckers, cardinals, chickadees, titmice, mockingbirds, nuthatches and more. Provide different types of feeders, too for birds in the winter--tube feeders offer perches for smaller birds like chickadees; goldfinches like to cling to net socks filled with nyjer seed or tube feeders with small holes; larger birds like cardinals find it difficult to cling to tube feeders and will appreciate larger tray type feeders. Some birds prefer to feed on the ground, so be sure to spread some food for them--a mixture of seeds, raisins, breadcrumbs--and mourning doves, sparrows, and more will come flocking. Do be sure to place at least one feeder near a window where you can observe the birds at close range. If you have a problem with gray squirrels raiding your feeders, investigate the several types of "squirrel-proof" feeders available, or watch them eat up all your birdseed in a flash! You might consider a special feeder for them with cracked corn, peanuts and sunflower seed to keep them well-fed and out of the birdfeeders. Also, squirrels don't relish safflower seed, but many birds do, so consider using safflower seed in one of your feeders. Keep the feeders clean by allowing all the seed to be eaten and then scrubbing and allowing to dry thoroughly before refilling to prevent the spread of disease. Move the feeders to different areas occasionally and rake the seed hulls from the ground. Birds need clean water year-around for drinking and bathing. You can place a shallow birdbath on a pedestal in the garden or build a shallow, sloping dish on the ground with premixed concrete. Scrub it with a brush and hose it out periodically to keep it clean. A shallow pond or fountain with a pump to recirculate the water and keep it moving is a lovely garden feature and will also provide water for the birds. 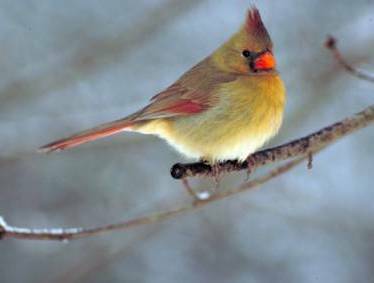 By providing food, shelter and water in your garden for the birds in winter, you will help them survive and they will repay you with song and color, and help keep weed and insect populations under control.